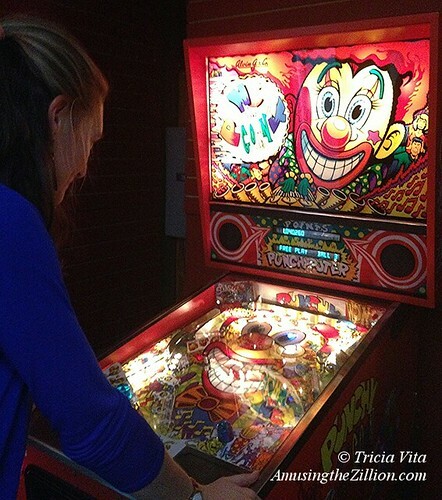 Last weekend at a birthday party at Modern Pinball NYC, Manhattan’s new mecca for pinball, one of the games we enjoyed playing was Punchy the Clown. It’s smaller than the other machines and has a decidedly retro look, calling to mind vintage pinball machines by Gottlieb. “Alvin G. and Co” is emblazoned on the backglass. ATZ asked Modern Pinball co-owner Steve Epstein how old it was and who made it. 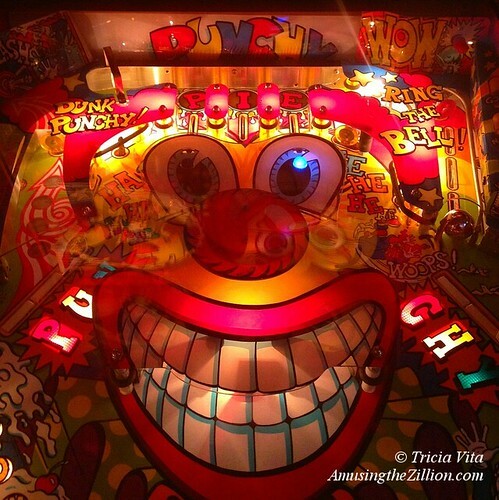 It turns out Punchy was manufactured in 1993 and is the most expensive pinball machine at Modern Pinball’s interactive showroom, with a sales price of $24,995 due to rarity, Epstein says. By comparison, you can buy the sleek, full-size games at Modern such as Dr Dude, Bram Stoker’s Dracula, Wizard of Oz and Batman for $5,995-$10,995. “Alvin G.” is Alvin Gottlieb, whose family established D. Gottlieb & Co. Pinball in Chicago in 1927 and sold the business in the 1970s. “In 1991, Alvin Gottlieb and Michael Gottlieb went back into the pinball machine business,” says Epstein. 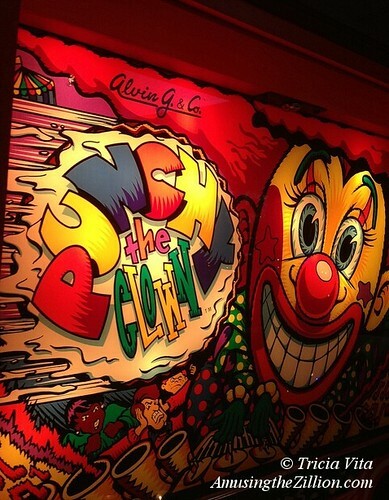 Since the company folded after releasing only five titles, one of which was the 1993 Punchy the Clown, the machine is rare. On the Internet Pinball Database, only one player has rated it, which is an indication of its rarity. He gave it a 9 out of 10. There’s also an original promo flyer for the game: “Punchy holds your ticket to a carnival of earnings.” The “Mini-pin™ configuration” featured an adjustable leg height for children and adults. It was designed as a redemption game for kids. Only 103 units were produced. When Alvin Gottlieb, 86, died in October, fans paid tribute on pinball discussion boards. “I’ll play a game on each of my Gottliebs today in his honor. RIP,” one commenter said, echoing the sentiments of many who grew up playing pinball. As previously noted (“Modern Pinball NYC Opens with New Arcade Business Model,” ATZ, November 15, 2013), players buy time– $7.50 for a half hour, $10 for an hour, and $20 to play all day– in the pinball showroom, which has 31 games. Located on Third Avenue between 26th and 27th Streets, Modern Pinball is open 7 days a week from 11AM to midnight, with later hours on weekends.